Another fill-in/inventory story, this is written by series editor Ann Nocenti (at least, she was the series editor when it was published), with art by future New Mutants artist Bret Blevins, making him the third former or future New Mutants artist to work on the series (keep your fingers crossed for Rob Liefeld's Star Wars!). 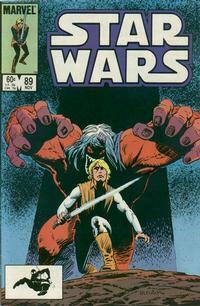 The cover of this issue, likely unintentionally, is reminiscent of issue #77’s, with Luke being dwarfed by a hulking figure; here, he’s facing the reader instead of the creature. 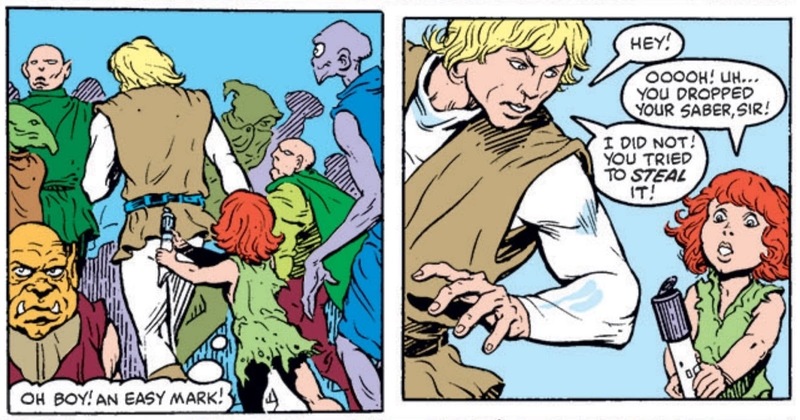 While this issue was presumably written before Return of the Jedi, a narrative caption esablishes that it takes place after the fall of the Empire. Presumably, it occurs after the movie and before Luke is sent out on the mission with Plif that culminates in him finding Rik Duel's game and Kiro. 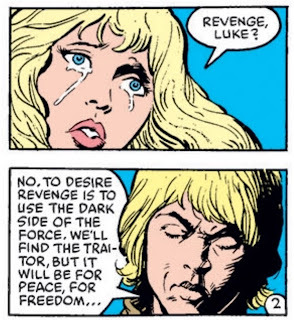 Luke rightly points out that acting in revenge is acting via the Dark Side of the Force. Luke's lightsaber hilt is drawn like the one he had before he built a new one just prior to Return of the Jedi (though artists have always played fast and loose with the look and color of his lightsaber throughout the series). 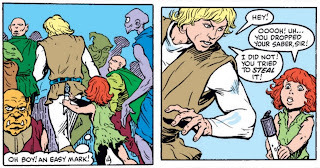 Luke uses the Force to pull Mary from a mob up into a second level window. He also uses it to interrogate a possible rebel traitor. Braxas looks like a wheelchair-bound ET. Remember Return of the Jedi? When Luke is told that truth often depends on a certain point of view, it’s either a missed opportunity to callback Ghost Obi-Wan’s similar phrasing in Jedi, or, if this was written before the film, a huge coincidence. 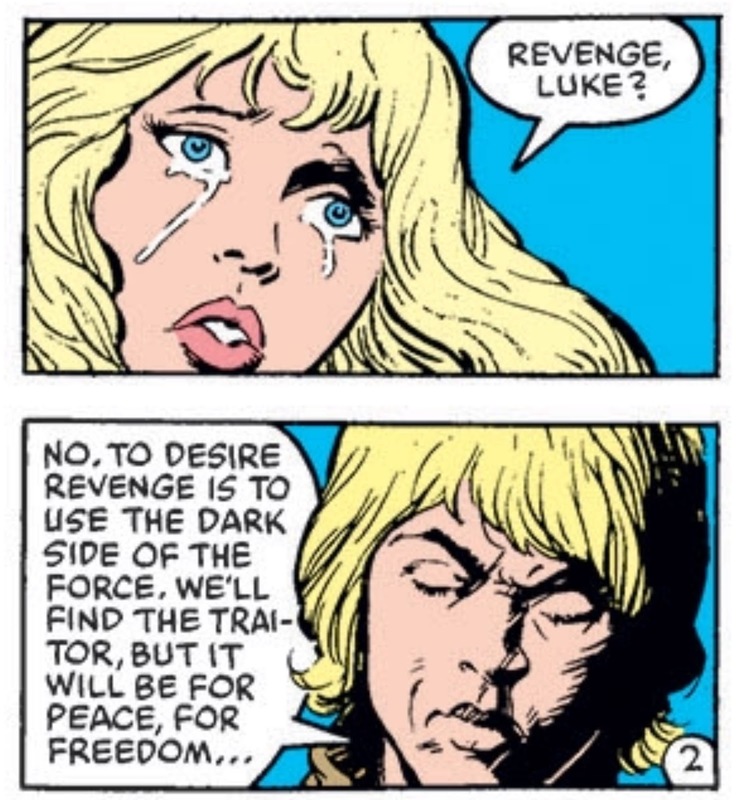 Luke thinks to himself that Mary reminds him of Leia, then a page later kisses her, further suggesting this was written pre-Jedi (and therfore pre-sibling rveal/love triangle resolution) and the celebratory “end of the Empire” captions added after the fact. “Morals-shmorals” is apparently a linguistical device that exists in the Star Wars galaxy. 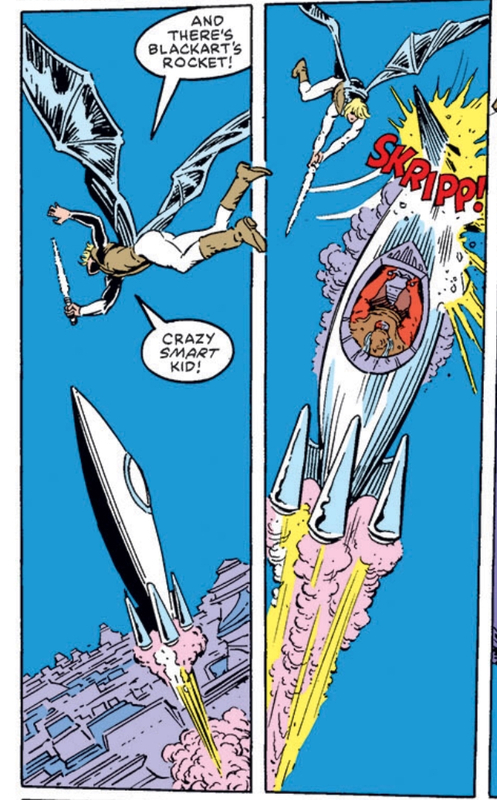 Luke also says “rocket” instead of “ship”. Scorpions exist in the Star Wars galaxy. Responses to letters tease the previously-suggested trip to Kashyyyk occuring in the near future, as well as the return of Fenn Shysa. There's also an ad on the letters page for the licensed Transformers series (which began as a limited series but was converted to an ongoing when it turned out to be a sales hit). We're back in fill-in/inventory story burn-off territory, and even worse, this is an Ann Nocenti-written fill-in, so on top of the usual sci-fi trope-heavy, self-contained narrative featuring just one main character, there's plenty of instances where the characters & narration spell out the themes of the story in the most heavy-handed way possible. 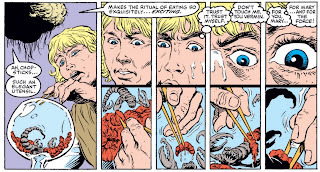 It also doesn't help that, despite having been editing the series for awhile now, Nocenti's Luke falls somewhere between "a little off" and "wildly out-of-character" in terms of characterization (of course, it's possible this story was written before Nocenti worked on the book regularly), with him vacillating between wanting vengeance and recognizing it has a path to the Dark Side, while showing greater interest in romance than at any point post-New Hope. 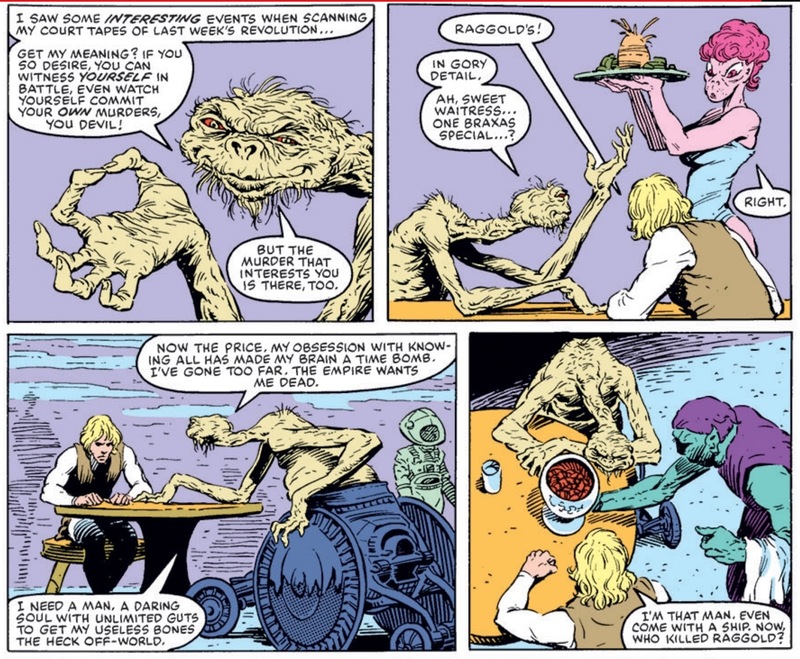 A bright spot to this issue, however, is the art from Bret Blevins, whose work plays up the fantasy elements in Star Wars' "science fantasy" approach, populating this story with colorful aliens & settings that would feel at home in both a more traditional fantasy story as well as a more explicitly sci-fi one (reminiscent, in many ways, of his later New Mutants work on the Gossamyr/Spyder and Asgard stories). 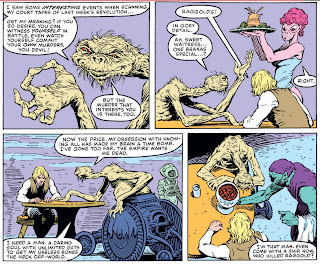 The arthelps keep this issue from being a complete wash, but it's not enough to fully offset the off-key Luke & Nocenti-isms populating the script. Luke & Leia are reunited! "Luke rightly points out that acting in revenge is acting via the Dark Side of the Force." There is a fine line between revenge and getting justice done...something that would be interesting to explore with regards to a Jedi. Not as good as the recent fill-ins starring Leia, but hey, not all fill-ins can be winner. Indeed. And it's something this series could have done while still staying within the boundaries given to them by LucasFilm. I thought this was a quite interesting fill-in issue, and did work well for a post-Return of the Jedi plot. It was interesting, because of the questioning of the Republic, and the real-world parallels with United States' foreign policy. Instead of a brutal dictatorship forced on the planet, it took place on a world where the people truly supported the Empire. The government had been legally elected and enjoyed much popular support by many of the people. It questioned the morality of the Republic. Was the Republic going to perform regime change, because the Empire was evil? Or, would the Republic respect the wishes of the populace and have to tolerate the existence of a pro-Imperial government? Then, that brings up questions of if the Republic isn't acting just as authoritarian as the Empire, in forcing its will upon others. Oh, you have no idea how much I want to do that. I'd LOVE to do something with both Transformers & G.I. Joe. I'm sure I'll get to those someday (at least, I hope so...), but short a massive influx of Patrons or a lucrative book deal, it's not something that'll happen in the near future. But it's good to know there'd be an audience for it, and it wouldn't just be something I'm doing for my own pleasure, which definitely helps make it more likely to happen. I know this series has always had a different feel than the movies (or feels, plural, given the diverse hands) but the captions on the splash page updating us on the post-ROTJ status quo are so close to the films’ trademark opening crawls that the exclamation points are really jarring. Read ’em again, mentally subbing in periods, and until the last one they'd actually work pretty well on screen. Apart from that, I’m sorry to say, I found the script absolutely dreadful. The chopsticks stuck out to me too. I wouldn’t argue that no culture in the (far, far away) Star Wars galaxy has similar utensils but seeing them called by the name we use for them was odd.